This Twitter fiction netprov is based on a simple enough premise: reality star Spencer Pratt lost his his cellphone while in London for Celebrity Big Brother, and it was found by a struggling poet who began to use it in whimsical ways to promote poetry. During the three-week performance, the poet prompted Pratt’s followers to write poems based on constraint he provided, was outed as an impostor, dubbed as Tempspence, continued to develop a relationship with his readers as he shared details of his life, and eventually migrated (reborn?) to a new account, @Tempspence, as Pratt regained control of the account. With this work the authors of OccupyMLA extend their artistic inquiry into identity in social media by “occupying” a celebrity account (with the owner’s permission) and using it as a performance space that comes with a large audience to begin with. They don’t occupy it directly, however, they do so with a carefully scripted character, inspired by Arthur, the protagonist of Edmund Spenser’s “The Faerie Queene.” As the performance unfolds, readers’ familiar with Spenser’s epic poem can easily recognize parts of its plot mapped onto Tempspence and modern day London. In addition to the fun poetry games and engaging narrative arc, the larger story is the dynamics of audience trust when unwittingly drawn into what is essentially an activist work. 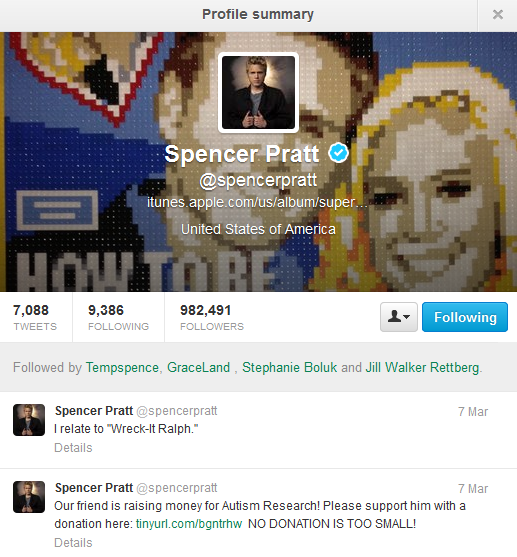 Before “Reality” the @SpencerPratt twitter account was a fairly typical celebrity twitter account, in which Pratt tweeted about his life, interacted with his followers, and directed his almost a million followers’ attention to causes or topics he was interested in supporting. Once the putative phone changed hands, the beginning of the relationship between the newly authored @SpencerPratt and his followers was a dream come true for many, because they were getting retweeted like never before. These 15 seconds of fame are prized because they are a mark of recognition: something they wrote and tweeted got the attention of a celebrity and was shared online with hundreds of thousands of people. Tempspence himself seemed caught up in the excitement of the moment, as he realized the power— and responsibility— he was donning with this Twitter account. Perhaps realizing he had a greater responsibility to his vocation as a poet, he quickly began a series of poetry games with his followers, using the prized retweets and follows as a kind of currency to reward those who played along. The poetry games played are a wonderful testament to ancient, modern, and contemporary poetic constraints, and the poems produced by @SpencerPratt’s followers show they were quick learners in what became a kind of Twitter course— the kind taught at Underacademy College. And some of the lessons were more subtle. Tweets like “I came across a notice for The West Port Book Festival in Edinburgh and thought Heidi & I might grab a flight!” are like a smart bomb, focusing the power of celebrity to direct an audience to a cultural event they might not otherwise attend. Sure, the followers who go just to see Spencer Pratt and his wife Heidi Montag are going to be disappointed, but at the same time they get the thrill of the chase and a chance to be exposed to some book culture. On a similar vein, the tweet “Can anyone recommend little bookstores in London where I might find some quality poetry? I’d like to buy something special for Heidi” and its follow up when he gets a quick, obvious recommendation “yes, I know all about those. But I’m looking for favs. Undiscovered gems! The more obscure the better!” send followers on a search for small, independent bookstores with specialized content. Whether the followers are in London or not is irrelevant: fans eager to please Spencer Pratt are probably not in a demographic known to be interested in obscure bookstores specializing in poetry, but they may do their homework and be exposed to an important aspect of book culture. It is worth mentioning that throughout the performance (judging from some tweets referring to this) @SpencerPratt received increasing amounts of negative tweets, particularly as the “truth” about the “person” writing in the Twitter account came to light. This is a crucial moment in the performance, because the trust that followers had in the account (a verified one, no less) had been betrayed. It is a testament to Marino and Wittig’s artistry that they were able to regain the audience’s trust by “coming clean” as an impostor and provide enough character-driven context to win over followers. As the audience gained interest in the character it christened as Tempspence, they continued to participate in the poetry games, learning about poetry, electronic literature, the Oulipo and more than they imagined they’d learn when they chose to follow @SpencerPratt. As the netprov unfolded, willing participants got to write poetry and interact with a fictional character, while those uninterested in interacting with anyone that wasn’t the “real” Spencer Pratt wrote hateful tweets, unfollowed the account, or simply tuned it out. No one is forced to follow anyone or read anything in Twitter, after all. Did those followers who became emotionally invested in Tempspence’s situation feel betrayed when they discovered he was a character? Perhaps. Was this unethical behavior by the authors? No. They produced a work of performative literature, one that Spencer Pratt wished to direct his followers’ attention to. This is pretty much the same as watching a movie or TV show he recommends, except that it is much more sophisticated because it is a multilayered metanarrative about the performances of a persona. Ghostwriters may not have the most respected jobs in the literary world, but their work isn’t a crime: it’s an established extension of the author function. Spencer Pratt authorized Marino and Wittig to perform this work on a space that belonged to him (as much as anyone can own a Twitter account), along with an audience he had developed. Perhaps he risked losing some followers by playing a trick on them because it might lead them to reflect on how much of a scripted character the Spencer Pratt they see on TV and read on Twitter might be. It’s about time people realized that unreliable narrators aren’t just safely shut away in books anymore, because literature now extends into social networks and human relations. I recommend reading the whole transcript of this informally erudite and witty performance to discover a compelling story with a payoff worth analyzing but better left unspoiled. When you get to the end, note the use of the @ symbol at the beginning of each tweet to recognize who is being addressed in that final exchange. And return tomorrow to read an entry about @Tempspence and the Tempspence Poets. “@Tempspence” & “#tempspencepoets” by Mark Marino, Rob Wittig, et. al.